The day after i last saw Jenny and her sister i went for a walk during the break between Amma’s (Sri Mata Amritanandamayi Devi) morning and evening programs. I chose to go in a new direction, down a different street altogether. I felt complete about my experience with Jenny and wanted to let it be. I walked out the main entrance of the Hilton, turned right and headed West on Century Blvd. I felt as if i were in a state of heightened awareness, present to everything around me. What i saw seemed clearer and sharper than usual, like i was aware of the finest details in my surroundings. I had been experiencing this on and off since i first saw Jenny. The sidewalk was lined with blooming Jacarandas. As i walked past the first tree i was transported back to my childhood growing up in Mexico city. In one corner of our garden, framing the swimming pool stood two tall Jacarandas (pronounced hah cah rahn dah). When they bloomed their purple flowers created a gentle bouquet in the sky, and the fallen petals blended with the surrounding grass to create a soft green and purple tapestry, like an enlarged detail of a Monet painting. One of these trees also stood by a fountain near the entrance to my grandmother’s garden in Cuernavaca where we used to spend our weekends. Years later when i lived on the island of Maui i remember driving upcountry on the road to Kula, and there on the left, shortly after passing the turn off to Haleakala highway stood a magnificent Jacaranda. When it was in full bloom and the wind came up the purple flowers would cascade down to the road and field below. Every time i saw it i would experience the slight tug of nostalgia on my heart. As i followed the Jacarandas lining Century Blvd. i passed the Marriott hotel. About a block or two further down the road i paused on a corner. There was a narrow street, more like a driveway, going off to the right. I looked diagonally across towards the Crowne Plaza hotel. 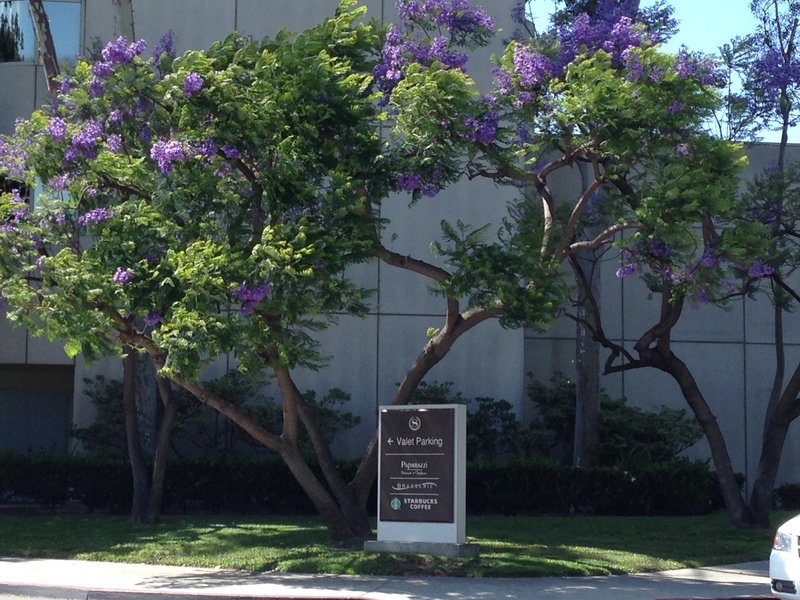 Across the driveway from where i was standing, on the opposite corner by the hotel entrance, there was a small grove of blooming Jacarandas. I looked at them for some time. It wasn’t so much looking, more like merging with. I was aware of being pulled toward something familiar, comforting and peaceful. A pull to go sit beneath the trees and meditate, to allow myself to be held by these old friends and sink into emptiness. This is the entrance to a hotel and not a place to meditate came a voice from far away, some distant internal realm of “don’t” and “should”, “right” and “wrong” thinking. My whole being longed for me to accept this invitation. To allow, to receive, to take in the gift that was being offered. I slowly made my way over to the trees and there, beneath them i found a soft green and purple carpet waiting for me. I looked down, found a spot and sat. My eyes closed and i was gone. All i remember is going to a vast, deep quiet place. Thoughts would go by in the distance like on a far away screen. This is a public place, the entrance to a hotel… I watched them go by. I felt peaceful and happy. I was simultaneously connected to all parts of my body as well as the space inside and surrounding me. All the external sounds were distinct and in harmony with the inner silence. The absence of time. I have no idea how long i sat. I started coming back, and found myself resisting. I wanted to stay in this internal universe forever. The thoughts got nearer and more frequent. I could see myself coming towards the surface, like i imagine a diver might experience as she comes up from a deep dive. The pauses to adjust and recalibrate to being in the outside world, and in those pauses the thoughts became more noticeable. I sat for a while taking in my surroundings. Slowly shapes and sounds seemed sharper, clearer, more distinct. And i was connected to it all. I bowed down in reverence to Amma, the Earth, the Sky, to all Beings. I got up and as i walked away i turned to take some photos, a tangible memory of this blissful moment. In case i would ever question the realness of it! I headed back to the hotel where i was staying and was flooded by a sense of peace and a profound knowing that i was not alone. I thought of my family, my grandmother, of growing up in Mexico. In that moment i experienced in my whole being how rich my life is and has been, the fullness of it all, and that i wasn’t alone. I was with me. I clearly saw that this most amazing moment happened when i was alone with myself, and that i was a wonderful companion to me. I knew that this precious, divine, timeless moment, like the one i had with Jenny, could only happen when i was alone. Me with me and Amma. I fully experienced loving myself and who i am. Strong feelings of wonder and gratitude flowed through me. Once again i felt touched by how clear everything looked, as if i was in all that surrounded me, or it was in me. A sense of being held and enveloped in loving care. I got to fully experience and know that i am lovable, that i am loved, the beauty of my being. As i approached the hotel i saw a small group of friends conversing with each other as they walked in my direction. I wasn’t yet ready to interact with others. I hadn’t spoken since before i started my walk and i was still coming up through the layers of my inner journey. I wanted to remain in silence and savor every moment of this bliss. Somehow it seemed like i was invisible, as if i had been cloaked, and i passed them smiling internally, grateful for the extra time to be with myself. I went up to my room and some time later connected with Parimala, the roommate with whom i had shared my experience with Jenny the day before. Once again she was there for me as she witnessed and offered me her presence. 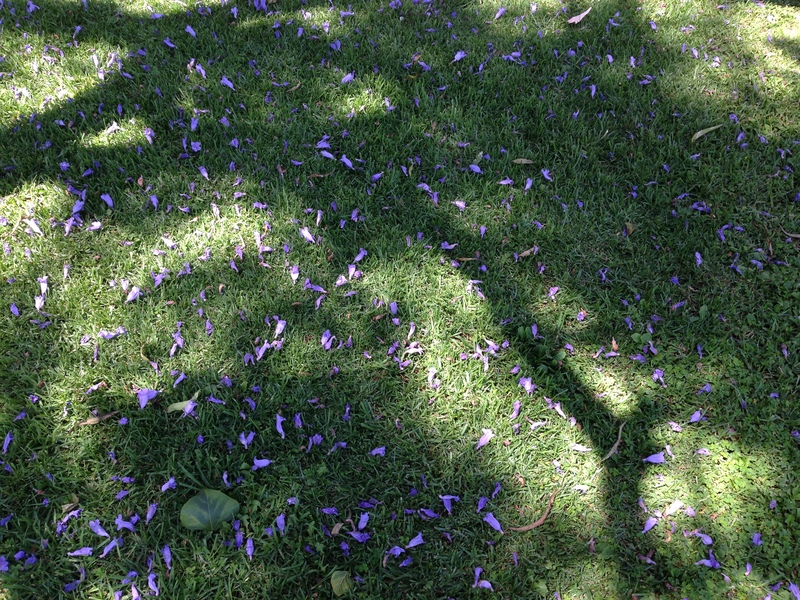 Somehow in the sharing it made my meditation under the Jacarandas real, tangible. Is it because what i experienced was so out of the ordinary and my mind wanted to make sense of it all? It seems that in this journey my mind was removed from center stage and it wanted to be included, to grasp and record what had happened. And also, this was so big for me, i wanted to share it, to share my joy and bliss! Like a young child wanting to share her excitement about something magical and wondrous. As Amma’s summer tour continued and made its way across the Southwest to Texas and then North to Chicago and on to the East Coast and Toronto i continued to have similar moments while i travelled on the tour bus. Moments of oneness with my surroundings, as if i could find myself in everything and everyone. Precious moments like when i sat by a lake watching the setting sun reflected on Amma’s face as She sat meditating. Seldom have I been in the presence of the embodiment of such peaceful stillness. I wanted my eyes to remain open, to etch this image forever in my memory, in my cells, every part of my being. Finally i surrendered, letting go. My eyelids closed slowly as I sank into the sounds of gentle waves and shimmering summer leaves. The sounds rocking me as I lost myself in Her divine face. Some time after i returned from tour i was having tea with my friend Holly and she referred to an experience she had as one of “being suspended in a state of Grace”. When i look back at this 2014 summer tour i know i was continuously held by Amma, suspended in a state of Grace. I believe that we’re each on a journey and if we stray from our paths, we become unhappy. From time to time, I’ll meet someone new who is anything but. Thank you for sharing this. Thank you for letting me know that this piece was meaningful and resonated for you. I am enjoying a sense of companionship and understanding. Once again, this is very beautiful writing, and so effortless to read. I particularly liked this idea, which suggests the redundancy of both the notion and sense of aloneness; at least, how it may become so in a vision such as you had. I am grateful for our feedback Hariod and to hear that reading this piece seemed effortless to you. The journey felt effortless so there is a sweetness in knowing that the reading of it can have the same quality. What a wonderful experience. Thanks for sharing it with us. Yes it was, and continues to be. I am glad to hear you enjoyed reading about it.